Welcome to the Ironhill Citadel, a whole fortified citadel mapped out in every single aspect. That’s it: every single building has been completely mapped out, for an amazing number of 102 maps! From a small fortified settlement, the citadel has grown to become a neuralgic trade center. The Ironhill family runs wisely the citadel from five generations and the current ruler is Lord Tarman. Even if the Ironhill family ruled wisely and flawlessly for centuries, some problems to be dealt with still came up, such as smuggling and trading of illegal goods, not to mention the eternal war with the marauding orcs. During the time, other kingdom powers settled in the citadel adding a church and a military district. Currently there are six districts in the citadel: Lord’s District, Military District, Citizens’ District, Church District, Market District and Gate District. The citadel features a vast underground complex also, widely known simply as “the Dungeon”. • Ironhill Citadel: This is an overview map in a smaller scale of the citadel, it features six maps that can be assembled to form a roughly 24x22 inches map. These are eight-maps Blueprints featuring a single district: ground floor and first floor. • Ironhill Citadel Rooftops (Exclusive of the Virtual Boxed Set): This is a twenty four-maps Blueprint featuring a rooftop view of the citadel. 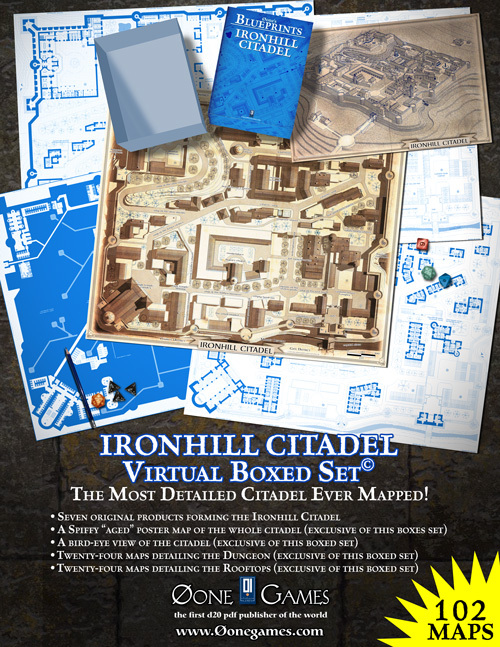 • Ironhill Citadel Dungeon (Exclusive of the Virtual Boxed Set): This is a twenty four-maps Blueprint featuring the underground of the citadel.